Chigborough Campsite01621 852113work Touring & Camping ParkA tranquil lakeside touring and camping area a short walk from the sea and Heybridge Basin. Nestled amongst 130 acres of arable land and fishing lakes. Chigborough Farm is a peaceful, rural oasis between Heybridge and Little Totham on the outskirts of Maldon in Essex. An excellent base for exploring the historic market town of Maldon and The Blackwater Estuary and further a field into North Essex. We are situated just a 10 minute walk from the sea wall which leads to the villages and pubs of Heybridge Basin or Goldhanger. The campsite is the most recent addition to the accommodation on the Farm and is situated next to Home Water our largest Fly Fishing Lake at Chigborough. It is sheltered by hedging on the East, South and West and has paddocks, open farm land and The Essex Wildlife Trust Reserve to the North. The price includes a £5 voucher to be used in the Deli/shop or restaurant for every day spent camping on the site. 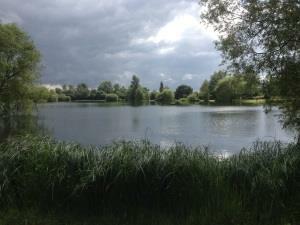 A tranquil lakeside touring and camping area a short walk from the sea and Heybridge Basin. Washing machine available as well as a fridge/freezer. Also on site Rubino's Restaurant and Tearooms, Maxwell and Mustard Delicatessen (01621 855579) Terajola Furniture & Gifts, welcome packs and Camping supplies (01621852048) Trout (fly only) and Coarse/Carp Fishing (07702244440) Pottery Painting Studio (01621852048) The Lotus Room - Pilates,Yoga and complimentary therapy(07812213042) Glamping options are also available on request..